$5 per Lb. BB's, $8 per lb. poly pellets. Colors: Blues,Greens, Red and Black, Light and Dark Wine, Purple and Fuschia. 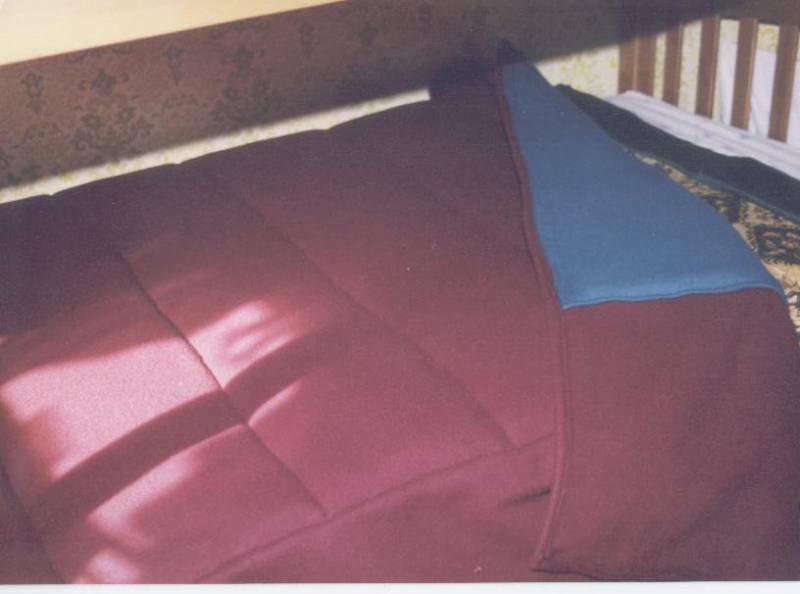 The Twin Blankets have the weighted area over the top of the bed with approximately 8" of non-weighted fleece on the edges. Note picture at left. Black area is weighted, 40"x56" , Purple is single layer fleece, for tucking under mattress. 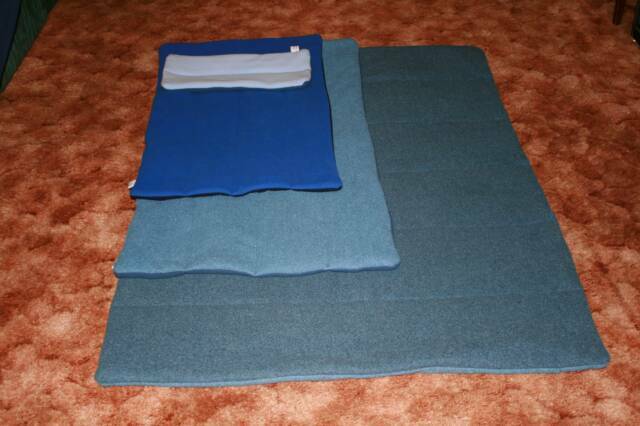 Large Weighted Shoulder Blankets are designed for teenaged or adult clients to wrap around their shoulders and warm and calm them while sitting at home or in classroom setting. In fleece they are 28"x44" with 4 lb of weights. 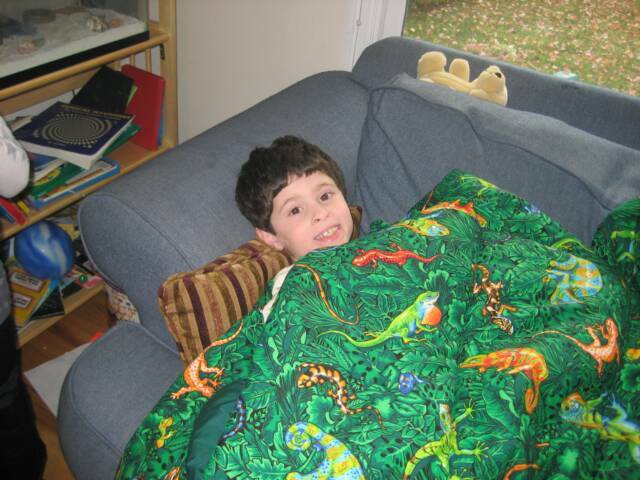 Small Weighted Blankets are designed for nap time or calming child while sitting on the couch or such. In Fleece they are 44"x55" with 5 lbs. weight. 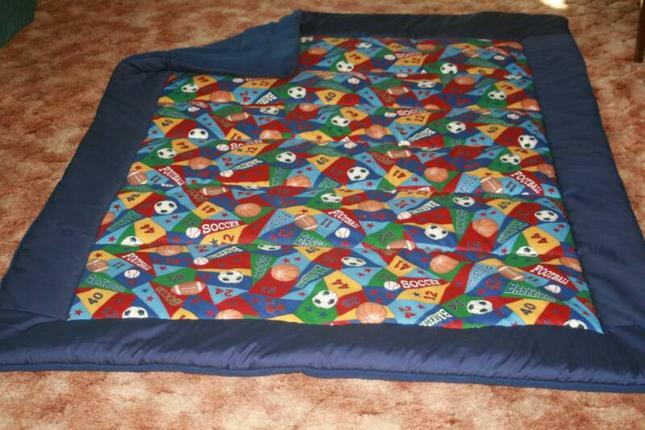 Small Weighted Shoulder Blanket are for young school and pre-school age children. They are "20 x "30 with 4 lbs of weight. Fleece Weighted Lap Pillows are to calm children in the classroom or home setting. They are 9" x18" and have 2.5 lbs. of weight. Fleece Lap Pillow with Pockets are designed for little fingers to put "figets" in the pockets to distract sensory system and aide in sitting still. They also have elastic loops in the pockets for little fingers to figet with. Please specify age of child and pocket preferrence, Builder Bob, Dora, Lizard, Balls, Horses, Wildlife. They come with 2.5 lbs. weight. Weighted Sheets are designed for the individual who has temperature regulation problems. Or for the summer months when fleece is too hot. They come with the standard 5 lbs. weight and are constructed in the same fashioin as the fleece blankets with the weighted area centered over the top of the bed with single layer sheet on both sides. Available in dark and light blue. Weighted Comforters are designed for the person who cannot tolerate fleece because of the fuzzy texture, or wants to have a picture print on their blanket. The weight is still positioned over the bed area but the backing covers the full area of the blanket as with a commercial comforter. See some of the pattern choices on the "Gallery" page of this website. Or if you have a preference that you do not see, call me and I may be able to get the fabric design you desire. These comforters also come with the 5 lb. standard weight unless more weight is requested. For use at nap time or seated in chair or couch. Prints available as with Twin Comforters. Same as above but backed with Fleece. When ordering products using the Paypal Buttons, please contact me with an e-mail message or a phone call to confirm color, print or special instructions, as I am new at using Paypal and with the varieties I offer, I have not found all the options for ordering that I am sure a more advanced person could provide on this website. Bare with me, I'm learning. I am a much better seamstress than I am a computer operator. credit cards with Paypal. If you are a customer in the State of Maine please contact me by phone as you have been in the past. Please do not use the Paypal buttons. Thank You. New Small Blanket with Removable Weight Packets. Useful for child who need to wash the blanket weekly or more frequently. Weight tunnels are held in a tube with velcro and can be easily removed and replaced. This blanket also offers the option of doubling the weight as the child grows. 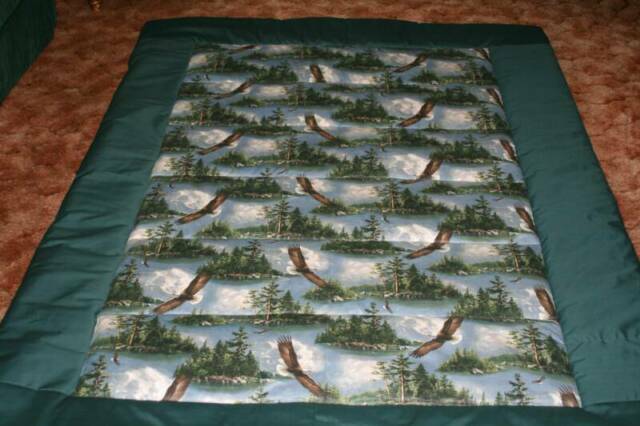 Features the same size 44"x55"
Blanket is fleece on one side and cotton on the weight packet side. Currently in navy or light blue. but can be increased to 10 lbs. Weight tunnels have velcro on the ends. The same blanket as above with the same features of removable weight tubes and additional tunnel spaces for adding more weight as needed. This blanket is 60" x 80"
It can be washed as many times as you would wash a sheet without any problems. tan & brown, light pink and purple and lavender. Standard blanket comes with 5 lbs. weight and can be increased to 10 lbs. 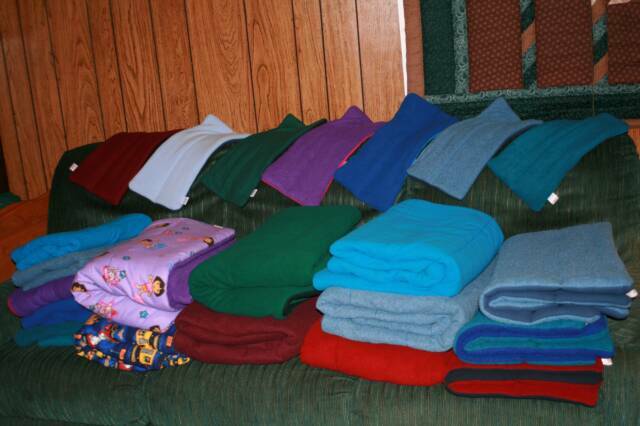 Heavier blankets available with special orders. This blanket was designed in 2008 for the client who has heavy nightly bed wetting issues. It is constructed of waterproof ripstop nylon which can be wiped down with spray cleaner and a cloth, after the duvay cover has been removed and machine washed. Constructed with snaps on the edges for attaching the duvay cover. The Duvay cover has snaps on the inside and a zipper at the bottom for easy application to the waterproof blanket. 5 lbs of BB weights is standard. Shipping weight 19Lbs. Please call me before ordering this product. Large Size Removable Weight Blankets.